With many deductions being eliminated or repealed, planning becomes even more critical. In light of these changes, it is a certainly a good time to have your plans reviewed by a professional. The bill informally known as the Tax Cuts and Jobs Act was signed into law by President Trump on December 22, 2017. The bill is the most significant change to the tax code since the Reagan era, and while it was advertised as a simplification effort, it has in fact introduced a number of uncertainties that make proactive tax planning and flexibility especially important. At BNY Mellon Wealth Management, we're committed to helping you determine how this new law will affect you and your family. We've compiled answers to some of the most common questions we've received to help you better understand both the short- and long-term implications of these changes. What are the key changes included in this law? How significant are these changes? What affect will the new law have on the economy and investments? Our investment outlook for 2018 has not changed much as a result of the tax bill. We expect broad-based global growth in 2018, with only a modest lift in economic activity from the tax bill given the late stage of the U.S. economic expansion. As a result, we have adjusted our forecast for real gross domestic product in the U.S. to an annualized rate of 2.7% for 2018, up modestly over 2017. The tax bill is likely to have a greater impact on corporate profits. In fact, we've estimated that the cut in corporate tax rates could increase operating earnings for S&P 500 companies by roughly $10 and have increased our 2018 forecast to a range of $150 to $155. The yield on the U.S. 10-year Treasury note has been moving higher as a result of tax-related pickup in economic growth, but increasing concern about an inflation surprise has also been a contributing factor. The upward trend in rates has been the catalyst for recent equity market swings; however, we continue to believe that inflation will drift modestly higher and that interest rates will settle in a new range. While higher interest rates and inflation can weigh on equity market valuations, we believe equities will be supported by better earnings. Therefore, we continue to favor equities over bonds as well as the incorporation of non-correlated assets. The deductibility of corporate interest expenses are now limited to 30% of a corporation's earnings before interest, taxes, depreciation and amortization — the first time there's been a limit on what companies could deduct in the way of interest expense. This has the potential to impact leveraged buyout opportunities where the purchase prices are often significantly levered with debt. The change in the holding period for carried interest from one year to three years is unlikely to have a significant impact on the way hedge funds are managed going forward. How can taxpayers take advantage of the remaining deductions? To make the most of their deductions, taxpayers could consider bunching deductions from multiple years into a single year in order to exceed the $12,000 or $24,000 standard deduction. For example, instead of allocating deductible expenses evenly across each year for the next three years, a taxpayer could postpone the deductions from year one and accelerate the deductions from year three so that they can all be claimed in year two in an effort to exceed the standard deduction. How does the new law affect divorcing taxpayers? The new law contains important changes that must be taken into account when completing divorce and separation agreements, and may present the need to renegotiate existing ones. While the elimination of the alimony deduction and the repeal of Section 682, which allowed for alimony-like distributions from trusts that were taxable for the recipient rather than the payor, only affect divorce and separation agreements executed after December 31, 2018, the elimination of personal exemptions — which includes the ability to claim an exemption for children — could affect existing agreements as well. How has the Alternative Minimum Tax changed? The Alternative Minimum Tax (AMT) for corporations has been eliminated. It remains for individual taxpayers; however, the exemption and threshold amounts for individuals have been increased. Are there any changes that taxpayers should keep an eye on over the long term? Portability of the estate tax exemption may be a concern. Because the increased estate tax exemption amount of $11.18 million is set to sunset at the end of 2025, it's unclear what will happen if one spouse passes away before the law reverts and the other spouse passes away after. Can the larger, unused exemption amount be transferred to the surviving spouse and then utilized after the law reverts? The Treasury Department will need to issue regulations on the matter. In the meantime, it's important to build flexibility into estate planning documents as it's unclear what might happen in situations like this. Tax rate schedules and other items are indexed for inflation every year. Under the previous law, they were tied to the consumer price index (CPI). The Tax Cuts and Jobs Act, however, will use a different method to calculate inflation — the chained CPI. 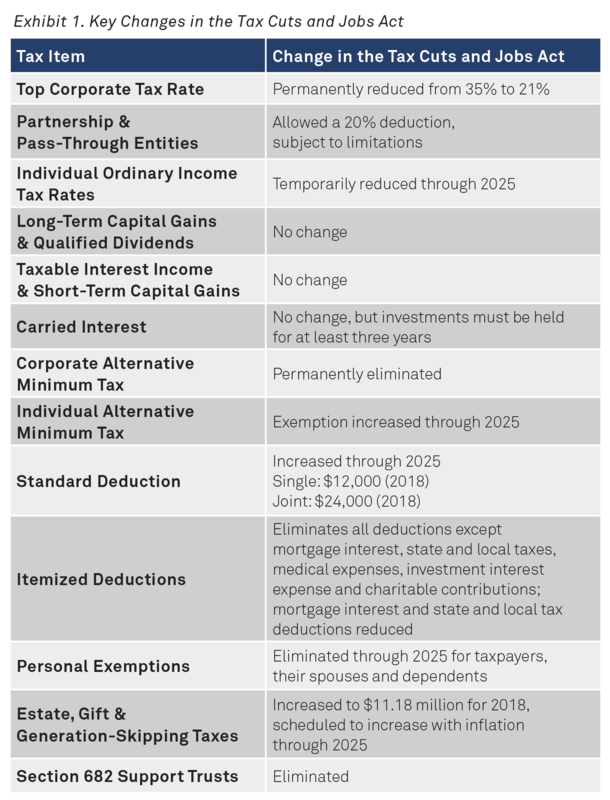 Using the chained CPI will cause exemption amounts and tax rate schedules to go up more slowly than they would if they were simply tied to the unchained CPI. In light of these tax law changes, it is a certainly a good time to have your plans reviewed by a professional. With many deductions being eliminated or repealed, planning is critical. Bunching the remaining deductions, taking advantage of vehicles like donor advised funds, and properly structuring pass-through entities could make a big difference in how much you owe in taxes going forward. We are encouraging everyone to review their estate plans, as the plans you have in place may not work as intended under the new law. At BNY Mellon Wealth Management we believe it is imperative that estate plans are flexible enough to address many of the uncertainties and challenges facing taxpayers today. 3 Debt incurred to acquire, construct or substantially improve your residence. Debt up to $1 million acquired prior to 12/15/2017 is grandfathered in under prior law. 4 Applies to divorce and separation agreements entered into after 12/31/2018. 5Generally limited to either 50% of W-2 wages or 25% of W-2 wages plus 2.5% of unadjusted basis, whichever is greater. 6 Anyone with a trade or business that depends on their reputation, i.e., people practicing law, CPAs, actuaries, people involved with the performing arts (actors, singers, etc. ), consultants, professional athletes, people in financial services, etc. This white paper is the property of BNY Mellon and the information contained herein is confidential. This white paper, either in whole or in part, must not be reproduced or disclosed to others or used for purposes other than that for which it has been supplied without the prior written permission of BNY Mellon. This material is provided for illustrative/educational purposes only. This material is not intended to constitute legal, tax, investment or financial advice. Effort has been made to ensure that the material presented herein is accurate at the time of publication. However, this material is not intended to be a full and exhaustive explanation of the law in any area or of all of the tax, investment or financial options available. The information discussed herein may not be applicable to or appropriate for every investor and should be used only after consultation with professionals who have reviewed your specific situation. Trademarks and logos belong to their respective owners. BNY Mellon Wealth Management conducts business through various operating subsidiaries of The Bank of New York Mellon Corporation. ©2018 The Bank of New York Mellon Corporation. All rights reserved.